I was at Deepdale in Preston yesterday for to see the Preston North End vs Charlton match in the English Championship - and of course also to see my Bro' Brian! PNE have had a good start to the season and hopes are high this year of a challenge for promotion to the Premier League. This is my third time in just over a year to go and see a PNE match - I'm beginning to feel like a regular! Early flight with Ryanair from Dublin to Liverpool followed by a cheap (£1.50) bus journey in to Liverpool Lime St station for a train to Preston. I met Brian at the station and we went to Preston Harley-Davidson for a look at some bikes and to buy a T-shirt. Brian liked the bikes and I felt like an expert showing him the different models. After this we had lunch in a Japanese restaurant during which the Japanese cook cooked our meal with a lot of ceremony right in front of us - delicious. We walked up to Deepdale just in time for a beer before the match. Preston played very well in the first half but fell behind to a daft penalty after Mawene tripped Varney as the ball was going wide (19 mins). In the second half PNE upped their game and were dominant, and were eventually rewarded with an excellent goal by Neil Mellor on 58 minutes - we had an excellent view of this as Mells cracked the ball into the roof of the net, 1-1. PNE pushed forward for the lead goal and Barry Nicholson obliged in the 66th minute. PNE in front and looking good. At full time PNE were deserving winners and kept an unbeaten start to the season intact - after three visits to Deepdale this was my first win. Fantastic! 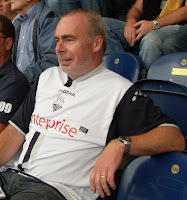 Brian took the picture to the right of me in my PNE shirt at half time. After the game we adjourned to a pub called the Moor Head for a noisy pint - we quickly moved on to the more sedate surroundings of Hartleys where we caught up on family chat and of course an analysis of the game. At 18.50 I caught the train back to Liverpool. In the airport there were a lot of Everton fans heading back to Dublin and Belfast - Everton had lost at home to Portsmouth (0-3) and the fans were not in celebratory mood. I'd be conservative in guessing that 70% of the flight back to Dublin was made up of Everton fans. Footie is good for Ryanair! Bizarrely, I was sitting beside the same bloke in the last row on the way home as I had been in the morning - he was on a day visit to Liverpool, but not for football. Oh, and by-the-way - yesterday was Roma's birthday. I gave her an Apple iPod Nano and then dissappeared to Preston for the day. I won't ask her which was the best present!! !